The photomicrographs and drawings reproduced here are copyright, they are my own work unless otherwise stated. The images made over a period of 20 years studying freshwater life vary in quality because of the hardware available at the time and my expertise, or lack of it. Desmids commonly multiply assexually by division. 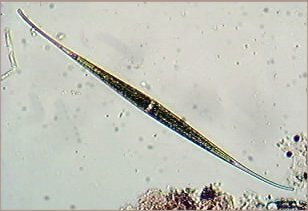 However they differ from almost all other alga in that in adverse conditions they conjugate sexually to form spores known as zygospores, the exceptions are a few of the filamentous algae such as the well known Spirogyra and Zygnema. The desmids were in the Class Conjugatophyceae for around a hundred years. Most authors now refer to them as the Class Zygnemaphyceae although I prefer the former. 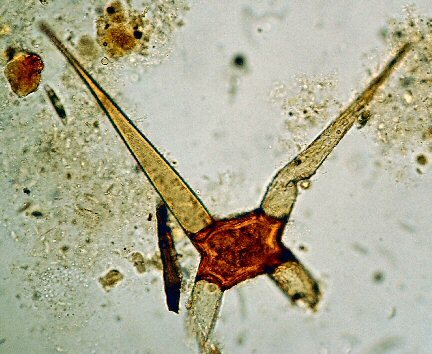 This is the desmid Closterium Kuetzingii. In this photomicrograph two Closterium kuetzingii have come together, the chloroplast from each has migrated to the centre to form the zygospore. The empty cells already falling away will break away completely leaving the red/brown spore. Page updated 23rd October 2006.